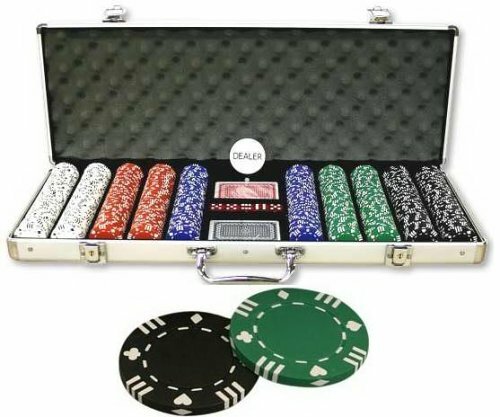 500 Stripe Suited 13.5 gram pro-quality clay poker chips with metal inlays. 150 White, 150 Red, 100 Blue, 50 Green, 50 Black. 5 19mm Red Dices and 2 Decks Poker Playing Card. 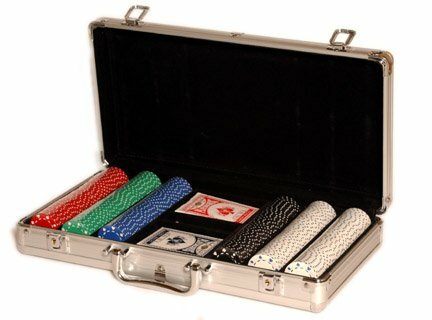 New aluminum (silver) and veneer (black) case features chip rack mold interior, sturdy hinges and lining for chip protection. 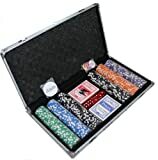 Includes 2 decks of cards and 5 casino-style dice. Added Bonus: Free Poker Chip Key Chain! Great Novelty Item! New aluminum case features chip rack mold interior, sturdy hinges and lining for chip protection. I bought two of these sets. Both sets were short one chip, which PokerGoods was happy to send me. The chips look good - the diamond pattern is clear and crisp. They have a nice smooth but not slick texture. They make a very satisfying "clack" sound when you toss them in the pot. Overall they are quite good, especially considering the price. 1. Thickness. The chips are not all exactly the same thickness. They are close enough that two stacks of 20 will measure up. It takes about 50 chips to add up to a 1-chip difference in thickness in the worst case. 2. The edges. There was some inconsistency in the smoothness of the edges of the chips. Most were good, but some had a roughness to them. Most people probably wouldn't notice. 3. If you look closely at the chips, there is a groove inscribed around both sides of the chips, about a third of the way in from the edge. In this groove, there is sometimes a bump of material, presumably from the molding process. In about 5% of the chips, this feels sharp to the finger. A little work with an Exacto knife fixes this. 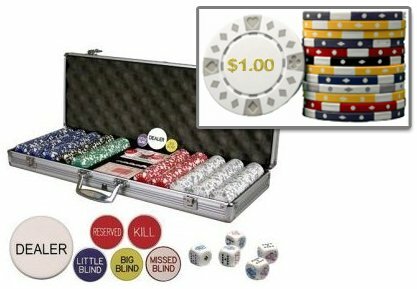 NEW 11.5 gram Casino Ace Poker Chip Design - Special Edition - Limited Quantity! 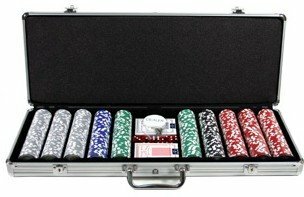 600 Double Suited 13.5 gram pro-quality clay poker chips with metal inlays. 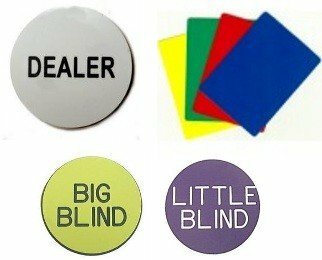 200 White, 150 Red, 100 Blue, 100 Green, 50 Black. 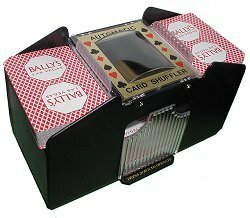 New 2005 HEAVY DUTY silver or black case features sturdy hinges/handle and lining for chip protection.